I’m aware I’m sending off unsettling vibes when, discussing vacation plans with my family, I tell them I’d like to see the UFC Bantamweight Championship title fight Nunes vs Rousey on December 30th. 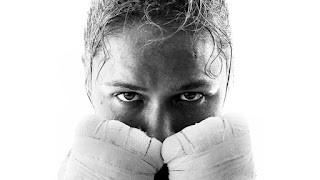 As I mentioned last May, I read Ronda Rousey’s autobiography, My Fight Your Fight, and developed a mild fascination with her life journey­–from the Olympian to Ultimate Fighting Champion. Not that I can stomach all that gore and senseless violence, nor do I find it particularly entertaining; if I want to see immense pain and suffering I just watch television. But I’m intrigued by the amount of commitment Rousey puts into her vocation, especially as a woman in a male dominated sport. Like most high achievers, particularly stuck by the deep understanding she has of the relationship between work and achievement than most people in my generation have. Ronda Rousey won eight UFC Championships before losing one–spectacularly. And this upcoming fight is everything about that one loss. Millions of people will be watching her either regain her title or forfeit it, mostly likely forever. It’s a vulnerable position to be in. It takes a lot of courage and discomfort to attempt. And I'm excited to see the outcome.